Watch our 30 second video on "How to apply a ring guard / ring sizer"
14k Gold-filled - 4 sizes to choose from. Ring Guards allow the ring to expand over the knuckle, yet fit snugly & comfortably on your finger. Ring guards prevent slipping or loss and keeps rings upright. Great for weight loss and for those with arthritis causing their knuckles to swell Read more..
End the frustrating, time consuming bother of clasping a bracelet with a little help from the Bracelet Helper. It gives you a helpful "extra hand". Bracelet clasp fasteners are a must for travel Read more.. 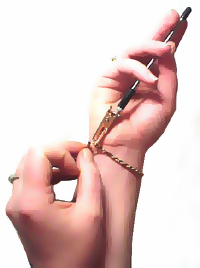 Easily used by people who have difficulty opening and closing conventional clasps. Attaches easily to any bracelet/ necklace clasp with extra stron magnets Read more..
12k Gold-filled - 4 styles to choose from including our most popular safety chain with spring clasps on BOTH ends. Easy to attach to your bracelet, necklace or watch. Read more..
Great to hide Bra Straps when wearing tank type or sleeveless tops. To increase dramatic results of cleavage use a bra clip with your favorite under wire bra Read more.. Simply attach to any bra with removable straps for invisible bra straps in an instant! One size fits all, 2 Strap widths - 5/16'(8mm) and 3/8'(10mm) Read more.. It's easy to tell friends to "View it Here"
Our goal is to leave our customers so satisfied they recommend us to all their family and friends. Even customers who decide to return our item find it easy to do. It comes with our money back if not satisfied policy. If you are not happy, simply return the item for a product refund. Over 15 Years have passed and View It Here continues to provide people ring peace of mind - Thanks to our customers!